Bring your career resolutions, friends, colleagues and business cards. Start the new year off right with “Goals that matter” and a fun night with members of Tulsa’s top professional associations. Discover how you can continue your education, foster relationships, inspire creativity and develop new skills all while enjoying tasty hors d’oeuvres and drinks. You’ll also have a chance to win one of ten great door prizes that are sure to give your new year goals a boost! 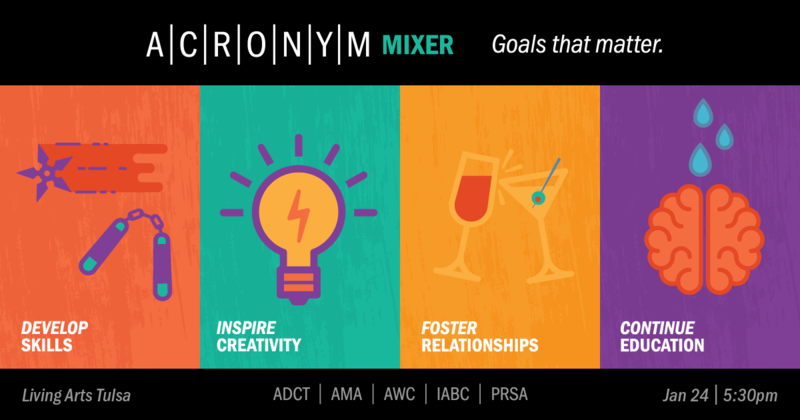 What: 2018 Acronym Mixer – A fun and festive networking party! Where: Living Arts of Tulsa, 307 E. Brady St.
Who: This event is open to all communications, marketing, and advertising professionals. Participating association members and guests. $20/all early birds (includes food and one drink ticket). $25/at the door and registrations after midnight on January 19th (includes food and one drink ticket). All proceeds from this event will be donated to a Living Arts community program.